Michael Kimber began his musical studies on violin and composed several short chamber and orchestral works in his youth. At the age of 20 he stopped composing and dedicated his efforts to becoming a violist, studying with Francis Bundra at the University of Michigan and at Interlochen, and with Raphael Hillyer, the founding violist of the Juilliard String Quartet. After completing his doctorate in viola performance, he began his professional career playing viola with the Alexandria Quartet, an American ensemble in residence at the Queensland Conservatorium of Music in Australia, followed by a year concertizing with the Kronos Quartet. 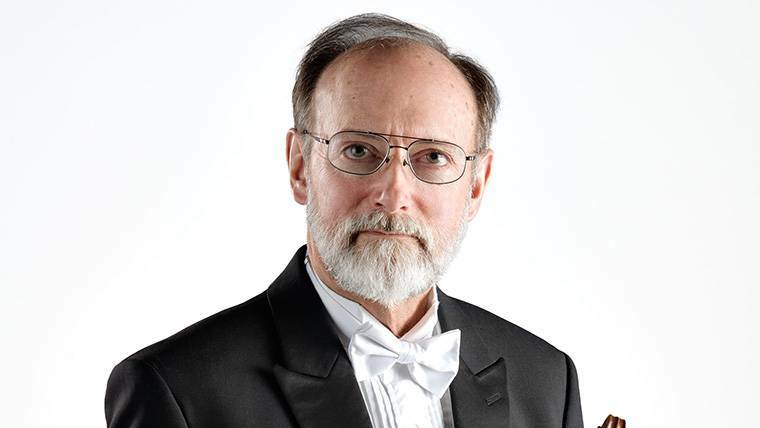 During twenty-five years as viola professor, first at the University of Kansas and then at the University of Southern Mississippi, he performed frequently as a soloist and with ensembles in North America and Europe. He began composing again in 1985. Since that time his music, especially his body of compositions for viola, has become widely known and performed. In 2010 the American Viola Society presented him its Founders Award in recognition of his contributions as a composer of music for viola. Four CDs of his music, recorded by Polish violist Marcin Murawski, have been released by Acte Préalable, with two more to follow. Michael is perhaps most often applauded as the inventor of the poly-pad violin/viola shoulder rest, tens of thousands of which have been purchased in all 50 states, DC, and 34 foreign countries. Symphonic music is my favorite music. I could not possibly pick a “favorite” from such a vast and rich repertoire. Playing Sibelius’ Third Symphony with Lisa Ponton as our principal violist will always be a very special memory. In 7th grade we were given the choice of spending one period of the day in band, orchestra, chorus, PE, or study hall. I chose orchestra and began learning to play violin (a late start by today’s standards). While a sophomore in college I saw the light, fell in love with viola, went to the dark side and became a violist myself. There are so many. Among violists, Kim Kashkashian and William Primrose. Among composers, Bartók, Shostakovich, Hindemith, Debussy. Teaching, possibly foreign languages or sciences.